As one travelled out of the village in the direction of Magheralin, there stood Waringfield House, another notable Georgian building. It was the residence of the Waring family who in 1876 owned more than two thousand acres at Moira. That house is long gone but the perimeter of the walled garden is still visible and included in the residential development now on the site. You far exceed them all. That live round his domain. Down by the Lagan stream. No human tongue can tell. Gabriel Beranger described a visit to Warringsfield (sic) with Miss Sharman. I saw, for the first time, glass bee-houses; they are made conical and covered with cones of straw, to make them dark, otherwise, I was told, the bees would not work. The hives stand in a kind of wooden press, in the middle of a garden. This press had small holes in the doors, to let in the bees, from whence they enter the hives. To show them, the doors of the press are opened, and the straw covers taken off, when I saw the bees at work against the sides. Mr. Warring has got the method from France of taking the honey without destroying these useful and ingenious insects. In June 1942, during World War II, the American military constructed a nine hundred bed convalescent hospital at Waringfield for the British Emergency Medical Service (EMS). It was to grow to one thousand beds the following year. Wounded soldiers from all parts of the world were treated at this hospital. Ambulances were always on standby awaiting the arrival of casualties at Maghaberry Airfield. For some time Waringfield was also the base for a Company of French soldiers. When the Ulster Military Hospital was transferred to Musgrave Park Hospital, the Royal Army Medical Corps presented their flag to Moira Parish. The buildings later became a geriatric hospital. Waringfield House was destroyed by fire and finally demolished in the late 1980’s. 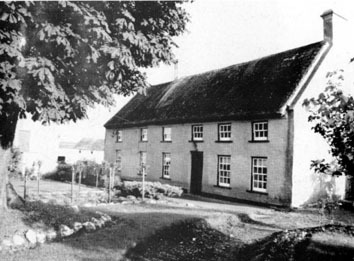 Trummery House, a short distance from Moira on the Lisburn Road, was built in 1625. It was the home of Captain Henry Spencer, an army officer in 1598 who was granted four square-miles of land in the area under lease from Queen Elizabeth I. He was governor of the Fort of Inisloughlin. Like many grand homes of the time it had an escape tunnel. Some make the rather unlikely assertion that it ran as far as the fort. The Spencer family held this land until 1728 when it was taken over by Jacob Bell whose family held it until 1884. Nineteenth century maps show extensive buildings, gardens and avenues but all trace of these are now gone. Moira today still has some buildings that give us a flavour of how our village looked nearly three hundred years ago. A number of them date from the time of the Rawdons or their successors. The earliest Moira building that is still occupied is Berwick Hall, the two-storey “Planters” thatched house on the Hillsborough Road. According to the present owner, the building dates back to 1697 and is Category A listed. It was owned by the Berwick family who lived in the area since the Battle of the Boyne or even earlier. The house is an extremely fine example of a yeoman’s home. Members of the Berwick family lived live there until the 1860s. George Wilson bought it in 1861 and his descendents still reside there. Down the lane beside the former Police Station lies the beautiful Magherahinch House. This secluded location keeps this gem well hidden but it is a very notable building. It affords majestic views down the Lagan Valley to the village of Hillsborough with which it has links. It is a five-bay two-storey stone and brick double-pile house. The front pile facing east was built in 1838 but the rear pile was built c.1720. The older part of the house is first mentioned in a will of John Bateman dated 1754, who left his “freehold estate in Magherahinch with my house and gardens thereon” to his dear wife Dorcas and thereafter to his son William Bateman. In 1833 the Marquess of Downshire purchased the property and in 1838 he added an additional block on to the front of the old house. A datestone and the Downshire coronet adorn the building. It is suggested that the Marquess used the house as a country retreat though he lived a mere six miles (10 km) away as the crow flies. Over the next one hundred years the house was leased to wealthy farmers including Joseph Green and his brother, Adam Agar and James Turner until, in 1929 the house was sold to Joseph Cresswell for £5000. Number 106 Main Street is now known as Beaufort House and is used for a business but the building was once the home and office of the land steward for the Moira estate. It is believed to date from 1760. Though a little under three miles out of the village, Kilmore House had a role in one lasting facet of Moira life. The original house was a Rectory built in 1750. Whether this belonged to Magheralin or Moira is unclear but on editions of the Ordnance Survey map of 1833, this building is labelled as the Old Rectory. The rectory is long gone but the Langtry family built Kilmore House there in 1854. Its owner was George Langtry, a merchant from Lurgan, who went on to bigger and better things. He bought Fortwilliam in Belfast in 1810 and became a renowned Belfast shipping magnate in the city. Anne Lutton, founder of Methodism in Moira, loved Kilmore and often visited her friends there. Miss Elizabeth Langtry was a “lady of good social position, intellectual tastes” and considerable attainments and she became a confidante and intimate friend of the young Anne as she began her Methodist ministry in the village and far beyond. A very different lady had associations with Kilmore House. George Langtry’s grandson Edward married Lily in 1874 and she is notorious for being the mistress of the Prince of Wales, later to become Edward VII, as well as having a string of other liaisons. It is not surprising that Edward Langtry ended his days in what was then called a lunatic asylum. It would seem that Moira once had a glebe house as well as a rectory. First edition Ordnance Survey maps in 1833 show a Glebe house where the old rectory now stands as well a Rectory marked on the land between Earlsfort and the detached houses on the Lurgan road. The Rectory was not marked on OS Maps dated 1860 so perhaps the Glebe House had become home for the Rector. The Glebe house was built in 1799 at a cost of £710. At some point it began to be referred to as the Rectory and was lived in by the clergy but was not captioned “Rectory” on maps until 1903. The house appears to have been built in stages; a stone above the ceiling in the kitchen is dated 1811 and a bay was added to the south elevation before 1858. Before the end of the twentieth century the rectory was sold and a new rectory erected in the grounds. Although renovated and having lost some of its character, the former rectory still resembles its earlier manifestation. It is now converted into a children’s nursery. Number 57 Main Street now trading as The Fat Gherkin was beside the old police station and for a time it housed the medical dispensary. Across the street, number 54, The Barrow, was a Post Office from the early twentieth century until the early 1970s. Number 50 was once the Presbyterian Manse. In 1866 numbers 76 and 78 Main Street were referred to as ’21 Town of Moira’. From the mid nineteenth century, the building was occupied and run as a hotel by John Murphy. Later it was bought by the Ruddell family, who also owned the garage in the Market House. They ran the hotel for thirty-five years until it was bought by Susan Heaney in 1926. It became a temperance hotel, using only the property now occupied by Robert Wilson. The hotel business closed in the early 1970s. Number 83 Main Street was once the site of a factory operated by Harry Ferguson Motors Ltd. during the second world war. He had two small production units manufacturing parts for his world-famous tractor and Bofors guns. After the war the factory was adapted by Derg Handwoven Tweeds Ltd to produce fabric.